Click the Green buttons to see our Online calculator and prices or the Blue buttons to see the product brochure. For Prices using our Online Calculator, just enter the sizes of the windows you need using the slider bars or enter sizes directly into the boxes provided and you will be given prices for any size of window in any of the energy ratings for any of our profile options, scroll down to add cills or patterned glass and be able to print the results or save to your computer (help button available). You can print out a single item or multiple items and send it to us as an order form, or call in and see us. This website is optimised for easier navigation when using mobiles and tablets. All of the windows and doors that we make are made to measure, we do not stock ready-made items. Please deduct any tolerances for fitting and give us the actual manufactured sizes of the frames! OR:- If windows are to be fitted behind brick or stone apertures add for the overlap required. Frame extension, 20mm, £3. per metre. Extras for your window might include a trickle vent ,also called a night vent, this provides a small amout of secure ventilation whilst windows are closed. Or you might like to have a woodgrain effect for your windows, this is available in mahogany or light/golden oak. We can manufacture both coloured types either with colour visible on the inside and outside of your home or as coloured on the outside and white inside. we can also fit silver or gold handle instead of the standard white. You can fill in the sizes of the window on our order form, alternatively you may wish to draw the window on a separate sheet. uPVC sliding sash windows are available in white or woodgrain finishes. Wide range of configurations and furniture. Call in to see sample in showroom and discuss. 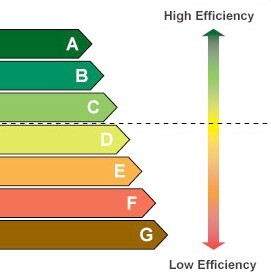 Window energy ratings are A B C D E F Just like the labels on your new fridge/ washing machine. A is the highest rating (most efficient), C is lower, and F is the lowest rating. The building regulations require that a MINIMUM of C rating is used. with Glass unit. Low E Glass, Warm edge Spacer and Argon Filled. with glass unit, Low E Glass, Warm edge Spacer and Air Filled. The thermal efficiency of a window depends on the performance of both the Glass units and the frames. 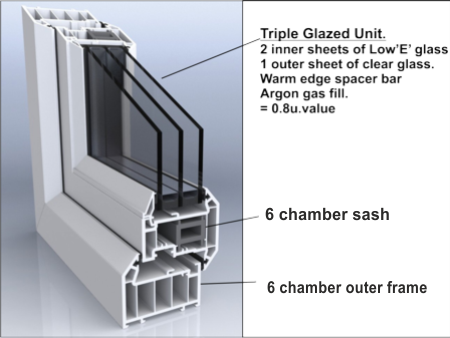 The Specific calculations are quite complex, so to make it easier for the consumer to recognize the thermal quality of the windows, they have been banded into groups A, B, C etc. 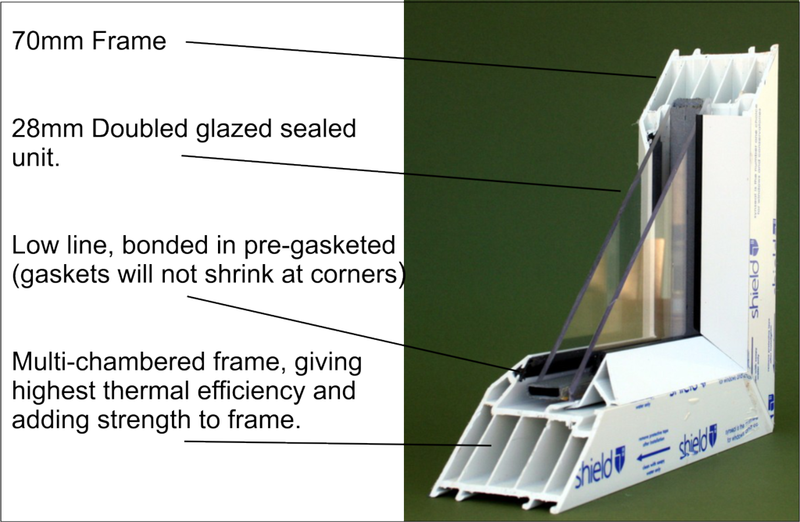 Multi chambered frames are thermally more efficient than single chambered frames. We now have 6 chambers in the main outerframe profile (See Photo above). 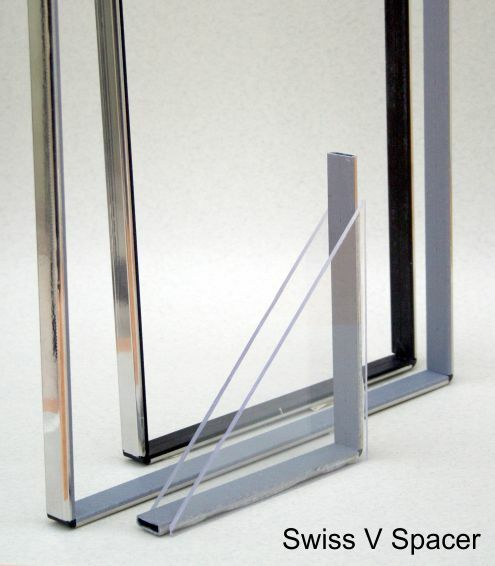 Thermal Inserts have also recently been introduced for mullions and transomes. These effectively increase the number of “Thermal chambers” in the sashes and Mullions. At the same time, rigidity of the frame is enhanced, so that usually, no further reinforcement is required. In some circumstances, such as woodgrain profiles, additional steel reinforcement is applied. But as this is fitted within the Thermal inserts, then thermal losses due to conductivity of steel are minimised. Tests have shown that Furniture screws, into the Thermal Inserts of the sashes give similar screw retention properties as steel. Another advantage is that screws will have less tendency to corrode when applied to thermal inserts, rather than steel (as the screws are fitted, they leave swarf which corrodes & breaks down the screw coating). 28mm overall thickness (4-20-4) (see diagram above). The addition of Argon gas (90% by volume) also improves the thermal efficiency. “K” glass (hard coat Low Emissivity glass) on the inner (room side) improves thermal efficiency by reflecting radiated (infra red) energy back into the room. Soft Coat “Low E” glass does the same as “K”glass, but much more efficiently. 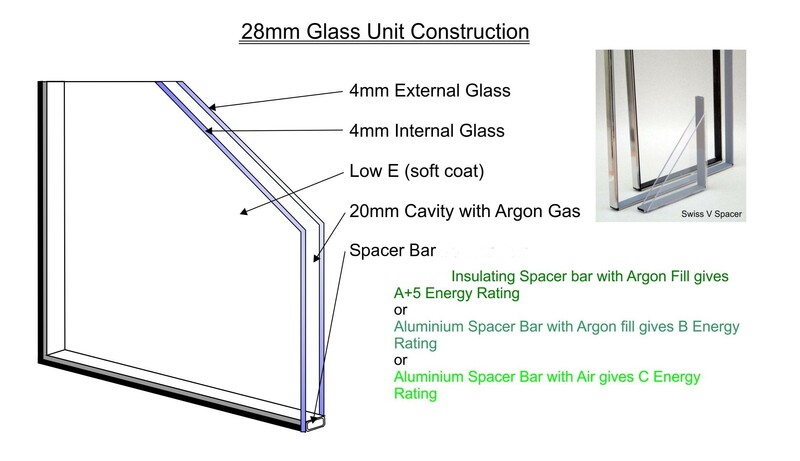 Aluminium spacer bar is less thermally efficient than the new “Insulating” spacer Bar. 40mm overall thickness (4-14-4-14-4) (see photo above). Or can be used to upgrade existing frames, to enhance Noise and thermal insulation. Synseal “Shield” 70mm system is internally beaded, chamfered bead. We now use 6 chambered outerframe as standard (on White profiles). We have copies of Full simulation reports from Synseal Extrusions Ltd. for the A,B andC ratings. Each report is 10 pages. And can be viewed at our showroom. Copies are available by post on request. Monday to Thursday 8.30am to 4.30pm (up to 8.00pm by arrangement) Friday 8.30am to 4.00pm only. After hours and Saturdays main phoneline transferred to a mobile.